Self-catering Villa with 5 bedrooms and 6 bathrooms. Sleeps 10. Saturday changeover. Self-catering Villa with 9 bedrooms and 6 bathrooms. Sleeps 20. Saturday changeover. Self-catering Village House with 3 bedrooms and 2 bathrooms. Sleeps 8. Non-applicable changeover. Self-catering Villa with 1 bedrooms and 2 bathrooms. Sleeps 4. Saturday changeover. Self-catering Gîte with 4 bedrooms and 2 bathrooms. Sleeps 6. Non-applicable changeover. The Gard (department number 30) is located in the region of Languedoc-Roussillon and has an estimated population of 623,000 (approximate in 1999). Situated in southern France, the department is named after the Gard (or Gardon) river, a tributary of the Rhone, which flows through the department. The capital of the department is the city of Nîmes. The Gard contains a part of the Cévennes National Park. Geologically, the department is varied with hills and mountains in the north west (the highest point being Mont Aigoual part of the Massif Central) and beaches in the south. There are numerous fertile valleys with waterways running through them. The rivers offer water sports including canoeing and kayaking and the countryside is especially inviting for outdoor activities – as well as walking activities available include horse riding, mountain biking, and climbing. The geography is varied, ranging from beaches in the south, through flatlands to rolling vineyards and finally mountains in the north. Although the Americans lay claim to being the origin of denim jeans, denim fabric originates from Nîmes, de Nîmes - literally meaning ‘of Nimes’ (de Nim) and this is what was exported to the USA to create the durable work wear trousers. Nîmes is probably more famous and certainly more visited for the ‘Pont du Gard’, the famous aqueduct constructed by the Romans to carry water from Uzes to Nîmes. It is the largest aqueduct they ever constructed and is an incredible feat of engineering. Another well visited monument is the Roman arena, known as Les Arènes. It is a well preserved Roman arena with an arcaded two-storey façade which conceals huge interior vaulting, riddled with corridors and which support tiers of seats with a capacity to hold more than 20,000 spectators. The main attraction was the blood and guts of gladiatorial combat. The great passion in Nîmes is bullfighting, and the gatherings are always well attended by both aficionados and fighters at the highest level. The most famous is the Feria de Pentecôte, which lasts five days over the Whitsun weekend. The town swells during this period and some two million people crowd into the town - hotel rooms need to be booked a year in advance! Known as the elegant city of the Gard, Uzès has a center that shows the visitor the richness of its past. The medieval town is a maze of small streets and squares full of private residences dating back to the 17th century. Although the Pont du Gard in Nîmes is the most visited remains of the aqueduct constructed by the Romans to move water from Uzes to Nîmes, there are remains also to be visited and seen at Uzès. Le Vigan is a gateway to the Cévennes. The D153 runs from the Pont de l'Hérault bridge, northeast through a typical south Cévennes landscape – deep valleys thick with trees and sparsely populated with isolated farms hiding in the hills. On the left bank of the Gardon river, beautiful countryside surrounds Ales with the gorges of the river Vis a particularly stunning sight. A completely walled town which has not changed much in appearance since the middle ages, Aigues-Mortes was originally a port on the Mediterranean coast. It now lies some 5 miles inland. Originally a fortified city with a moat protecting the inland side of the town, this has now been filled in. History abounds here. 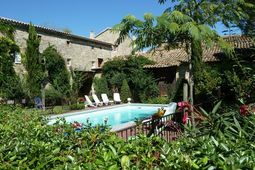 Holiday accommodation in the Gard is easily accessible. Nîmes has an international airport serviced by some airlines, others fly into Montpellier in the Hérault. If you’d prefer to travel by train, the TGV service runs from Calais to Paris and from Paris to Nîmes. The area has good road connections and is served by the A9 (E15), A54 (E80) and A7 (E714 motorways. The TGV service runs from Calais via Paris to Nîmes.